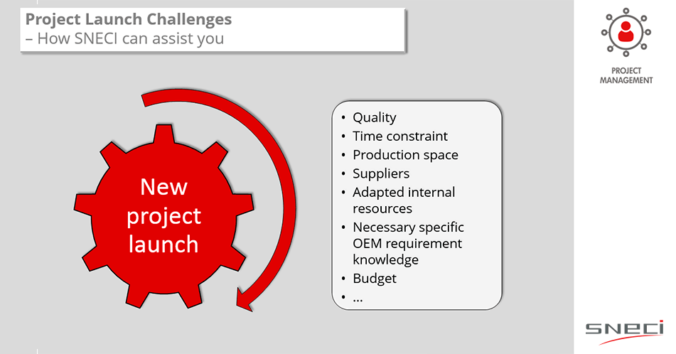 Project launch challenges – How SNECI can assist you? The plant runs its daily tasks and production. Current teams ensure their daily tasks and know perfectly what needs to be done. During the project launch companies usually take one of the teams to be responsible for it. Unfortunately, this person is taken from activities which worked perfectly and suddenly this person is missing in the process. On top of it, the selected person may not have the habit to launch new projects as it is a one shot activity for the plant. SNECI already provides support to many companies. We ensure the management of suppliers dedicated for your new project and our launch manager experts run daily activities on your site to ensure project launch with success, allowing you to fully focus on your ongoing projects.